Setting the stage for their forthcoming Hush releases, Noise for Pretend and Blanket Music team up for an eight-song EP, offering up four mouthwatering selections from each band. 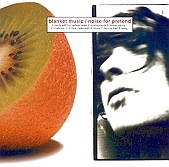 The CD starts off with Noise for Pretend's four songs. Martini-pop for the smooth, swanky cocktail lounge crowds, Noise for Pretend creates the atmospheric, low-key pop songs perfect for the guys and gals on the prowl. Next up is Blanket Music's four tracks, implementing everything AM Radio - pop, soul, R&B, and even some samba and swing for good measure. Cooking it all up in one big melting pop, they manage to lean towards the retro pop spectrum, but the other influences soak through on more than one occasion, making their four songs both flavorful and enjoyable. Quite the collection, these eight songs have my mouth watering for the new full-lengths from both of these bands. I'll give this a B.